Butterflies bring that special touch of elegance that will make your wedding day unforgettable to all who attend. You can release them individually or all at once. Some choose individual butterfly releases by guests. Each guest is given an envelope containing a butterfly with the bride and groom’s name printed on it. You also have the option of having each of your butterflies enclosed in a beautifully decorated release box or display cage. These containers also make a unique addition to your wedding day decorations. Just imagine, as you walk down the aisle you are greeted by live, beautiful butterflies in their release cages. Should you choose not to release your butterflies at your reception, they also make incredible living centerpieces for each table. Add a personalized inscription of the bride and grooms' names and wedding date to your release envelopes. No additional cost! Ordered a butterfly release for my sister’s wedding. They loved the surprise and all the guests enjoyed participating! The company was great to deal with. Very helpful and followed through on every detail! Make sure to follow the directions and you’ll have a time to remember. Thank you so much for donating the butterflies for the National Day of Prayer. It was truly a blessing. Your generosity was appreciated very much! I pray that your business continue to prosper by the Lord! Thank you again on behalf of Victory @ Sarasota and myself, Marcy S. P.S. "Every" butterfly flew! Thank you so much for taking the time out to answer all my calls and questions. My daughter requested this since my mom loved butterflies. As they were loading my mom in the hearse we released them. Some decided to stick around. It was very beautiful and was a great idea. I just wanted to say thank you for helping add a little more beauty in such a difficult time. Again, thank you so much. I absolutely loved the butterflies I ordered for my grandmothers funeral. When I called and spoke to the customer service representatives it was awesome. I had many questions and they were all answered. My very 1st time ordering butterflies and it won't be my last. I own CK Luxe Events, an event planning company and I will make recommendations to my clients. Thank you so much for making a special, amazingly happy moment for my grandmothers funeral. The butterflies came at 11:50. Promised time was 12. I was a little worried. But I followed the directions and all went well for our Nieces 3rd Birthday celebration. (First one in heaven). All went well. Would definitely recommend using this company again! Thank you so much! It was absolutely the most amazing thing to do!!! My entire family had a butterfly to release. It was a very memorable event and emotional as we released in memory of 2 family that had passed away. All of the butterflies survived the shipment to me. Clearwater had directions that were easy to understand. The packaging the butterflies came in with our name and wedding date were a very beautiful touch, and the release was a hit with the bridal party. Thank you! Chris and her team at Clearwater Butterfly have been such a joy to work with. 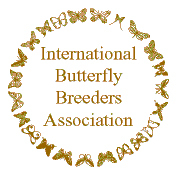 We have annual A Butterfly to Remember Memorial events around the country and Clearwater does a fantastic job of making sure we have our butterflies on time and correctly shipped. They are very professional and very nice people. We just had our Corporate Office event this am and my butterflies were there waiting for me when I arrived. Thanks Chris and team. Imagine, for a moment, a couple newly joined in marriage, standing at the altar in front of all of their friends, family members, and loved ones. 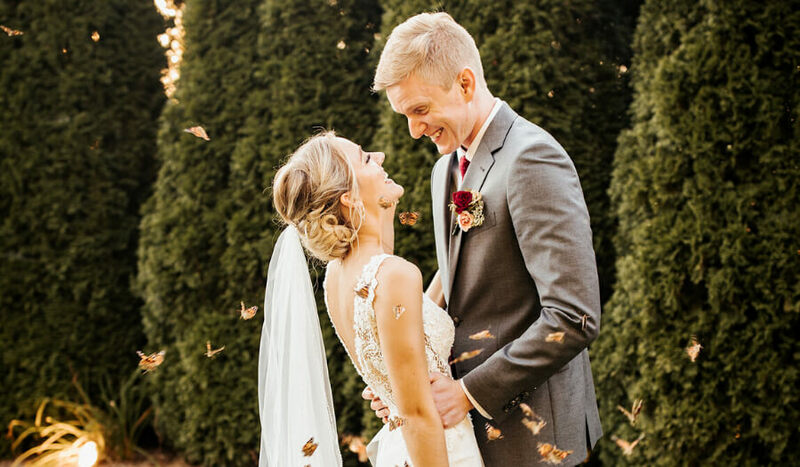 Instead of walking down the aisle after their first kiss as husband and wife, the bride opens a box, releasing dozens of beautiful butterflies into the air, where they soar above the crowd in celebration of rebirth and new life. Butterfly releases have long been an amazing way to commemorate a special occasion, introducing nature’s beauty into an important moment. Unique and special, these releases provide a moving gesture to commemorate an event that your guests will remember forever. 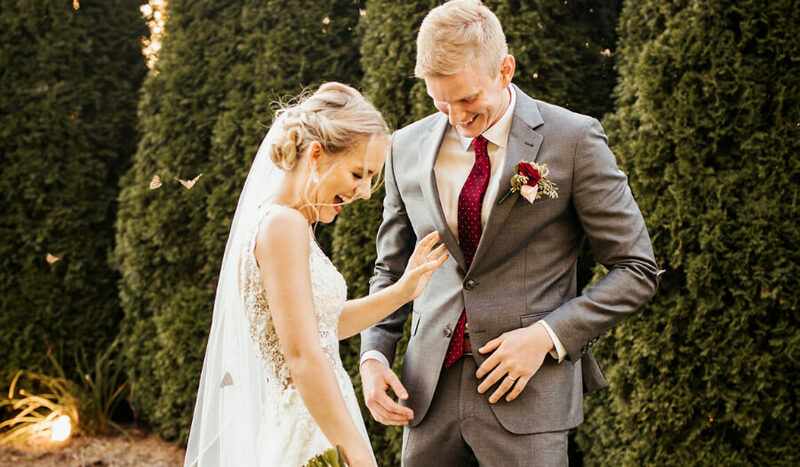 When you would like to add a unique touch to a celebration that’s dear to your heart, a butterfly release is the perfect way to make a special moment all the more so. View our featured wedding packages. Memorial services provide an opportunity for close family and friends to celebrate the life of a loved one and to be there for one another. Saying goodbye for the last time to a loved one at a funeral or memorial service is incredibly emotional and is very hard to do. Create a touching tribute for a person you love through butterflies. Releasing butterflies back into the natural world can create a beautiful, unique, and truly original way to add something special to a memorial service that you want to remember forever. Seen as a tribute to life, rebirth, and freedom, a butterfly release is an ideal way to make any important event into a moment you’ll never forget. Celebrate life and the beauty of nature, providing a touching tribute to the people you love in life, whether they are still with you or have moved on. View our memorial service packages.